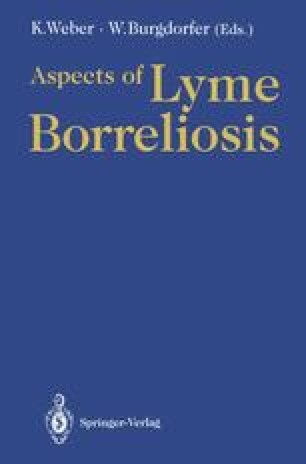 Lyme borreliosis is a disorder affecting many organs including the skin and reticuloendothelial, cardiovascular, nervous and musculoskeletal systems. The causative organism is Borrelia burgdorferi. After infection via a tick bite, a series of events follows in an attempt to destroy the microorganisms or limit its spread to other sites. The early skin lesion around the tickbite shows edema, vascular dilatation, extravasation of erythrocytes and an inflammatory infiltrate of neutrophils. If the causative organisms persist in the skin, the infiltrate shows predominantly lymphocytes and in many circumstances plasma cells.